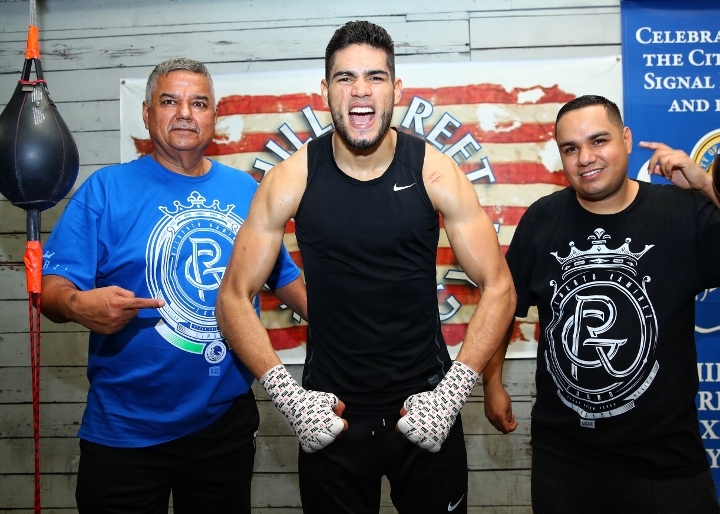 Miami, FL.- Cuban trainer Pedro Diaz said that his Colombian pupil, Roamer Alexis Angulo, has reached the fight week of his scheduled clash with World Boxing Organization (WBO) world champion Gilberto Ramirez of Mexico - and according to the game plan they focused on strategy, but at the same time realizing that they may go to war. "Alexis is fine, focused on the fight and regarding the possibility of going to a war... we are ready because whenever someone gets into a ring with a Mexican, he goes into that, into a war - whether or not he is a boxer with a renowned name, whether he is in his best shape or not., or is starting out [in boxing] or finishing up and he (Angulo) knows it," said Diaz. "It's going to be a great fight definitely and I think that's something that's a sure thing." Confident, but at the same time cautious, Diaz also said that the weight limit (168 pounds or less) is not an issue in because they made certain preparations to get down to the weight limit. Diaz is always making sure that his boxer never sacrifices anything to get down to a certain weight limit, but at the same time he ensures that his fighter is strong and in his best fighting shape possible. "So far it has never happened to us, where we ever had a problem with it (weight). Of course it can happen, but we have worked in such a manner where it won't happen that way when we step on the scale on Friday," Diaz said. The Angulo-Ramirez showdown will be televised by ESPN. Angulo is undefeated with a record of 23-0 and 20 KOs. The champion is also undefeated, with a record of 37-0 with 25 KOs. And the televised card takes place at the Chesapeake Energy Arena of Oklahoma City. Angelo about to accept an unnecessary beating if this fight actually happens. Zurdo should strive to unify the belts instead of fighting nobodies. [QUOTE=SkiPete;18893636]If you are thinking of Alfredo Angulo don't worry I did the same thing. [/QUOTE] You're right. My bad.